The Death Star map shows a painted scene in the center of the Death Star from Return of the Jedi, surrounded by various smaller, relevant paintings. 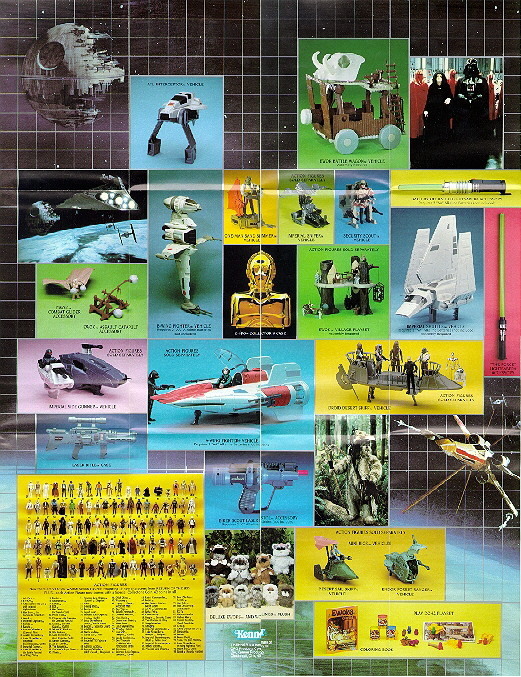 The final two border images are of an W-Wing being pursued by three TIE Fighters (bottom) and the Millenium Falcon beset by three more (lower right). There are also five arrows pointing to various other planets in the SW Universe. These include "To Hoth" (top) , "Sanctuary Moon" (right), "To Endor" (lower right), "To Bespin" (bottom), and "To Tatooine" (left). 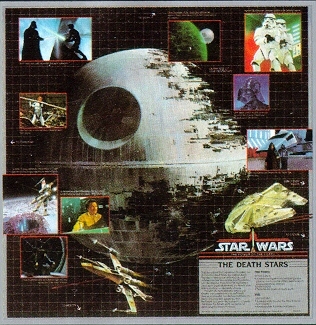 In addition, on the upper right corner of the large Death Star painting is a text block that reads "Crash Site of Star Destroyer". It is interesting to note that the names of the other two Planetary Maps are included. It is not known whether Bespin and Hoth were planned as Maps, but seems likely if the line had continued. Built by order of the Emperor and commanded by Governor Moff tarkin, the original Death Star was a deep-space battle station used to bring reluctant star systems forcibly into line with the Empire's "New Order." By exploiting a chink in the Death Star's armor, the Rebels were able to destroy it in the Battle of Yavin. The ultimate battle between Rebels and Empire was centered on a second Death Star, more powerful than the first, built near the Moon of Endor. With ground aid from the Ewoks, and under the leadership of General Lando Calrissian, the Rebels again succeeded in destroying the Emperor's threat.